Now you can build your AVAdirect system with the new Radeon™ RX Vega. Crank up your graphics quality and bring out every detail at incredible resolutions with the revolutionary “Vega” architecture. 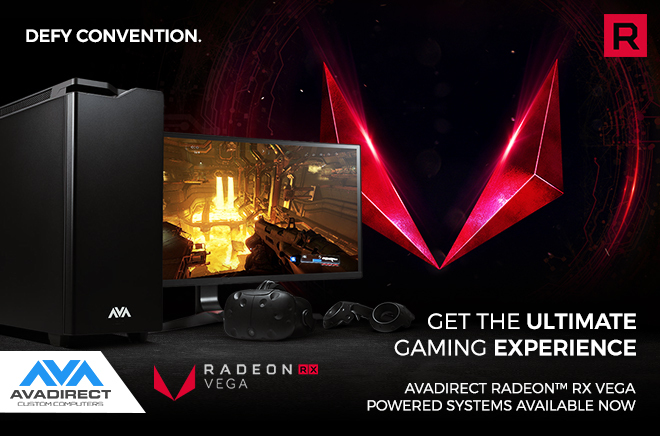 Step up to new generation Radeon™ RX Vega graphics and lose yourself in the greatest high-end gaming and virtual reality experiences with Radeon™ FreeSync technology. Radeon™ RX Vega graphics are built with a forward-thinking GPU architecture to deliver exhilarating performance in the newest DirectX® 12 and Vulkan® games on the latest displays.